Cashman Likes Double play Duo’s Praise for Gleyber. 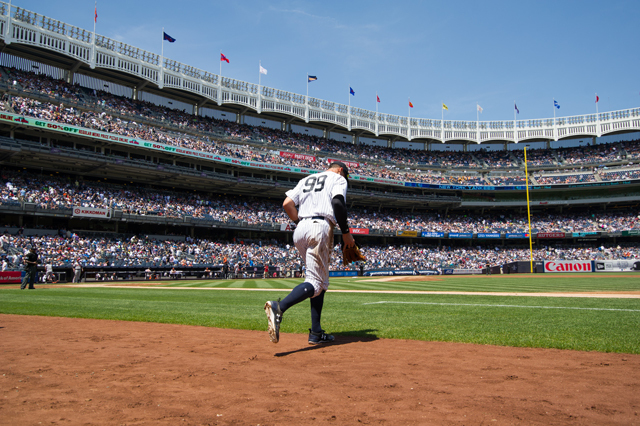 When I brought it to Brian Cashman’s attention the praise given to one of his star pupils, Gleyber Torres, from the greatest double play combination in the history of the game, Brian smiled and said,” they would know better than anybody. Between Roberto Alomar and Omar Vizquel you are talking about twenty gold gloves and a tremendous amount of knowledge of the overall game of baseball. That’s really something.” When I gave Gleyber the message from the dynamic duo, he smiled and said that he is truly humbled. By the way, congratulations on your first big league hit Mr. Torres. Luis Severino has become a clubhouse leader in more ways than one. As a leader in the game, the Thurman Munson’s, Lou Piniella’s and the Ron Guidry’s knew when to be serious, and when to be funny or crazy with their team mates in order to keep the team loose. The other day when Gleyber Torres got his first major league hit off the Minnesota Twins, the umpire threw the ball to the Yankees dugout as a souvenir for the young rookie. Severino had a ball in his hand and as he was catching the ball from the umpire he acted as if he was throwing it into the stands. If you kept your eyes on Torres you would have seen a shocked look in his face. At that point Severino put up the real baseball and everyone in the dugout began to laugh. Thurman would have laughed too! 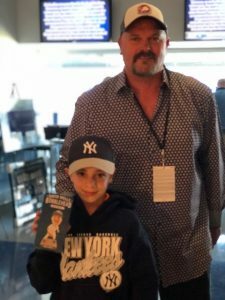 David Wells bobble head night was a great night for all the kids at the Stadium on Monday. Even though Wells didn’t reach home plate when throwing out the first pitch, the kids had a great time with the always so much fun Wells. When the kids got the figurine they couldn’t believe how the face looked so much like the real man. Even though most of the kids weren’t born when Wells threw his last pitch in the big leagues, they just couldn’t get enough of him up in suite six. I don’t think Wells has ever taken so many pictures. David by the way was wonderful to all of them. 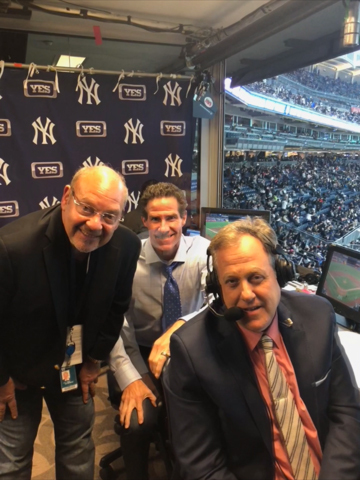 I got to see the big boss of the Yankees Broadcast team John Filippelli enjoying his broadcasters Michael Kay and Paul O’Neill doing their jobs. In between innings I asked the trio for a picture for their fans. I have to admit that even though I’m an old school guy who loved announcers Phil Rizzuto, Frank Messer and Bill White, these guys are pretty darn good. Vannessa Delossantos has been a police officer for quite a few years in the south Bronx. When not dealing with street thugs in the neighborhood, she gets a little down time protecting VIP suites at Yankee Stadium. 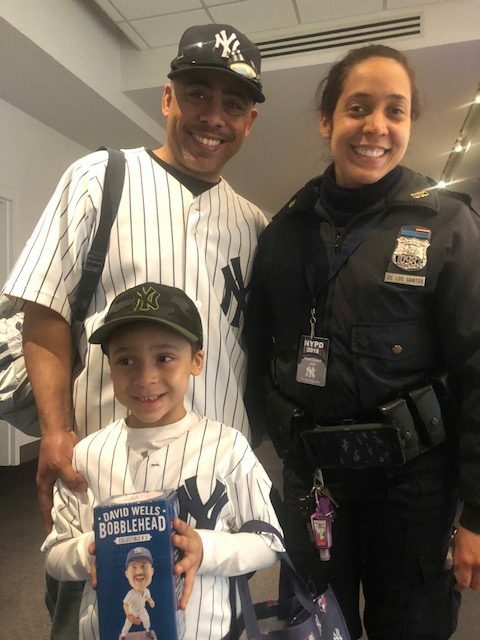 On the night that they gave out the Wells Bobble heads her husband surprised her by purchasing two tickets so that her son could see the Yankees play and see mommy at work and get a bobble head. If you don’t speak English then you’re listening to WADO. The broadcast team is led by radio legend Ricky Ricardo (no not Lucy’s husband) and Francisco Rivera. The guy that makes it all happen is producer Rene Luna. I consider Rene an unsung hero. He is one of the most creative and tireless producers that I have been around. I have been around a lot of producers at ESPN Deportes and not too many can hang with this man. I learn by watching because a wise man once told me whatever you can learn at any major university you can learn at the University of Steinbrenner. Well Mr. Steinbrenner was pretty much always right about those things. 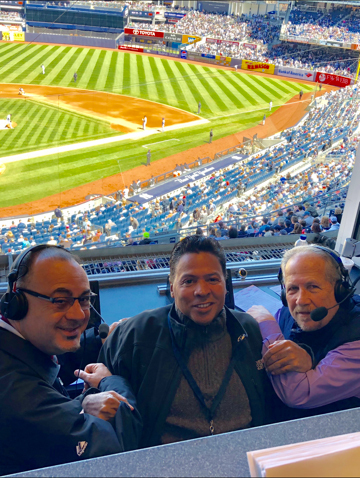 I know he would agree with me that WADO radio and Spanish speaking Yankee fans are lucky to have Rene and his two legendary announcers. On Friday night, the greatest second baseman of all time and Hall of Famer, Roberto Alomar visited Yankee Stadium. Robbie actually saved me a ticket so that we could do what he loves to do more than anything in the world, talk baseball. We talked about his team, the Blue Jays and we talked about analytics in baseball. I’m going to let you in on a secret, since Robbie was a little boy and his father Sandy was the Yankees second baseman, he has been a Yankee fan. Since Robbie lives in Tampa we get to watch the Yankees when they play the Blue Jays during spring training. The one young player that caught his fancy is the young second baseman Gleyber Torres. Robbie thinks that this kid is the whole package. The footwork, the hand eye coordination and he has power. The fact that Gleyber is a natural shortstop, Robbie feels that Torres is making the transition to second base very well. If anyone would know it’s the greatest of all time. I told Roberto that I had spoken to Omar Vizque l about Torres and Omar just loves the kid. When you can get such a wonderful endorsement from the greatest double play combination in baseball history I guess you’re doing pretty well and this officially starts the Gleyber Torres era. 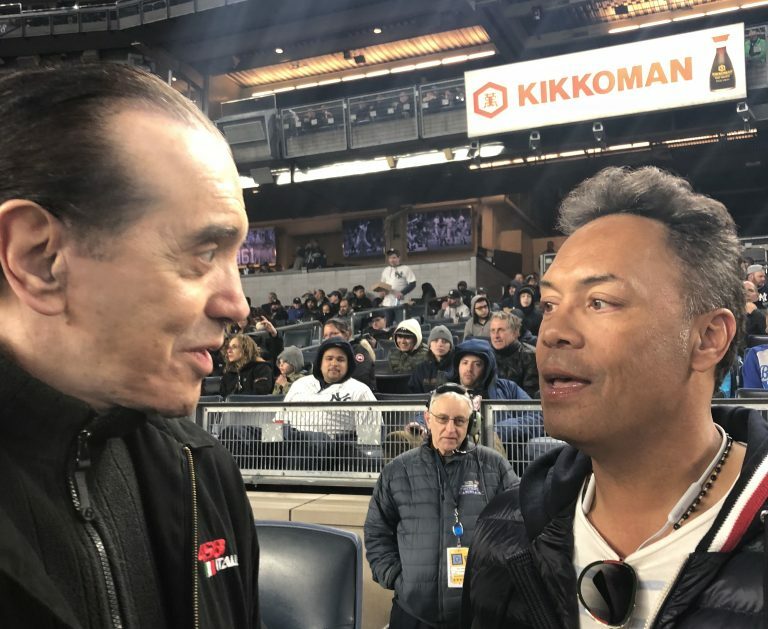 Chazz Palminteri also visited the Stadium on Friday and couldn’t have been more excited. Of the Hollywood and Broadway stars that visit the Yankees I would have to say that Chazz has to be the most knowledgeable of the game and I will also add, the biggest fan. The one ritual that I love about this man is that on every visit he loves to go to the highest level of the upper deck and find a father and his child and give them a signed baseball. It’s a reminder of him and his dad. Chazz let me in on a secret, his play A Bronx Tale, is going to be making a giant adjustment. Just what that is I will not say at this time or else I will have to deal with Sonny. Stay Tuned. Our prayers go out to my wonderful pal and baseball great Cecil Fielder. Cecil is having heart stem surgery this week. If you know Mr. Fielder than you know that he is a real good dude. A special congratulations to Jordan DeLorenzo. Jordan has been serving our country in the United States Air Force and Friday he graduated from the Suffolk County Police Department. He will be joining his brother, my son Jon-Erik Negron, in the 6th precinct. 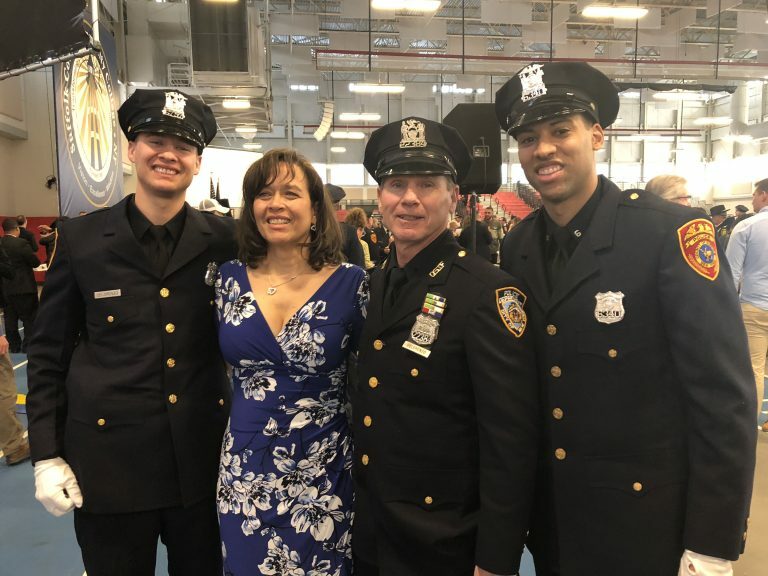 Jordan’s dad Jerry is a retired NYPD. Naturally they are all big time Yankee fans. Carlos Beltran visited the Yankee clubhouse this past weekend. 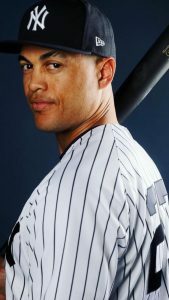 Throughout the years you have always heard about the class of this recently retired major league outfielder. One of Carlos’s best friends and a person that Carlos says is more like a brother to him is Portabella Clothing king, Joe Oks. When Carlos received his World Series ring, he had another made up for his longtime pal, Joe. 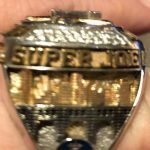 He had an inscription made which reads SUPER JOE. I have heard Carlos say through the years that you cannot pay for that kind of friendship. A beautiful act. Don’t feel badly for Giancarlo Stanton. He may have been the only Yankee without a hit but on the field he has had good at bats and actually just missed hitting a tremendous homer that just went foul into the upper deck in left field. In the clubhouse, he stood in front of the press and handled some good and not so good questions. One of the questions that impressed me came from a writer from the New York Times. He asked Giancarlo if he felt badly for the Florida Marlon players. Stanton responded by saying, “Hey those guys are playing on a major league team and they are living the dream.” I thought that this was a terrific answer. Too many players forget this. Giancarlo also told reporters that the work ethic of Aaron Judge doesn’t surprise him and he was very positive about his other teammates. In talking to Don Mattingly, he says that Stanton is the type of player that will, at different times of the season, carry a team all by himself. Another guy that has mentally worked hard to try to get his game going is Dellin Betances. Dellin has worked very hard in the bullpen with Larry Rothchild and he looked very impressive against the Marlins. This is a guy that, as we all know, has top closer stuff. Reggie Jackson is recuperating in Tampa after extensive knee surgery during spring training. The Tampa medical staff has done a wonderful job at getting Reggie back on his feet. You would think that they were getting Mr. October ready for the season as if he was still playing. 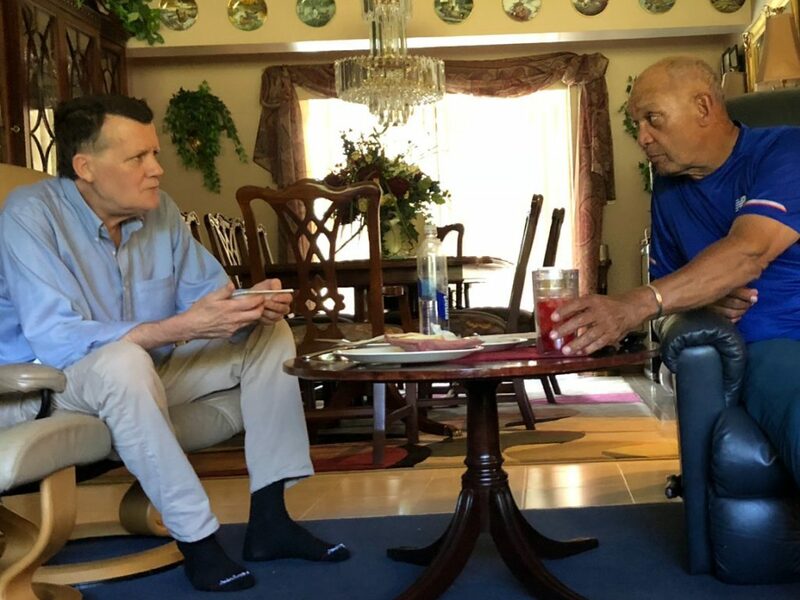 Reggie has spent his down time talking baseball with Yankee Co-Chairman Hank Steinbrenner. 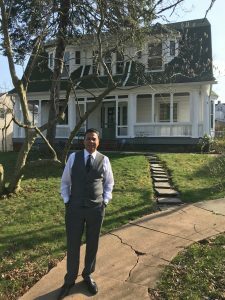 Today I visited a house at 9 Meadow Lane in New Rochelle, New York. This was the home of the great Lou Gehrig, he had purchased the house in 1927 and kept it until his death in 1941. The house is pretty much the same way as Gehrig had kept it. I met the neighbor next door, who had just moved in from Mexico. He asked me the importance of the house and I explained who Lou Gehrig was and that he had lived there. He looked over at the house and made the Sign of the Cross. I could almost feel the spirit of the Yankee Iron Horse. Finally, a special thank you to Music Icon, Rock and Roll Hall of Famer and Yankee fan, Frankie Valli. Frankie was performing at the Mohegan Sun Arena in Connecticut this past weekend. In order to help The Cristian Rivera Foundation, he entertained a small group that donated funds to the foundation. The Foundation has been fighting for a cure for Pontine Giloma, an inoperable brain tumor located in the stem of the brain, ever since losing little Cristian. 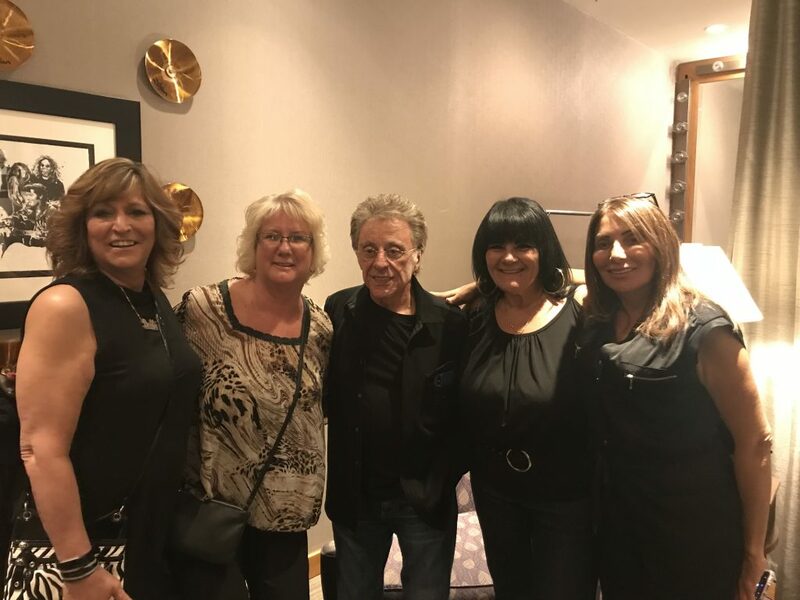 Frankie Valli and Maynard Strickland, from the Mohegan Sun Casino, should be commended because they understand what the parents of kids suffering from all forms of pediatric cancer must be going through. Frankie delayed an early exit from the arena after his show in order to be with his friends and supporters of this great cause. Ray can be heard weekends on the #1 show on ESPN Deportes the World of The Big Leagues. His also writes a weekly column for NY Sports Day, Newsmax and Baseball America. Giancarlo Stanton is the reigning National League most valuable player who, after an incredible first game where he hit two home runs, has had a couple of games in which he has struck out five times. Stanton has heard the booing from the Yankee fans yet just like the Mick and Ted Williams, says that he would have booed also. 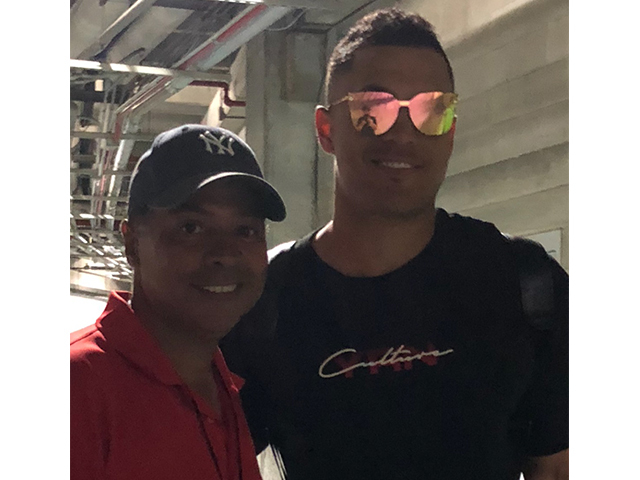 Stanton said after a game, “I hear them booing but understand the situation.” The one thing that we must remember about this young man is that he truly is a professional hitter. For that matter as Mr. October Reggie Jackson recently said to me, “Stanton is the whole package, don’t worry about him. 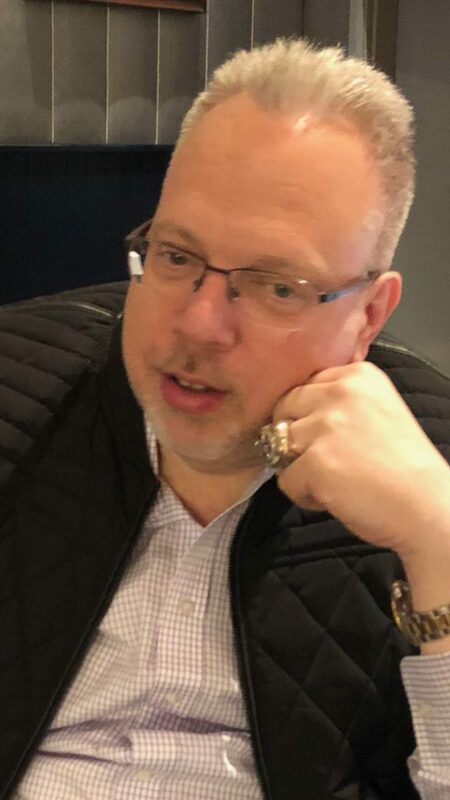 He will figure things out when he has his rough moments.” The major league scout that has seen Stanton as much as anyone is Atlanta Braves scout Tom Giordano. T-bone, as he is affectionately known, says that the Mets have had as good a pitching staff as anyone throughout the last few years and he feels that Stanton was always able to do some heavy damage against the Mets and there is no question about the damage that he will do in the American League. 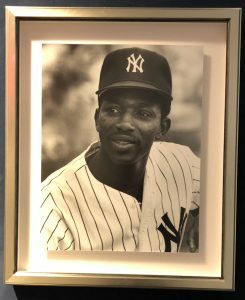 Whenever I walk into the suite section at the new Yankee Stadium, I can literally tell you where every picture on the walls are located. I can tell you that the photo of Babe Ruth with all the kids and the old lady with no teeth is by suite 68. A young George Steinbrenner and Reggie Jackson in street clothes on the left side of suite 56. The wonderful Thurman Munson is on the opposite side of suite 44. I can tell you that Billy Martin and Bobby Murcer are down by party suites 1 and 2. This past Sunday, I walked into suite 33 to say hello to sports promoter Andrew Levy and to pay my respect to a guy who does so much for a lot of retired players and people in general. He was sitting next to Mickey and Cookie Rivers. They had big smiles on their faces. I asked them to share in the joy and tell me what was going on. Cookie asked me, “Don’t you know?” I said, “Know what?” She told me that Mickey’s picture was put up in the hallway by suite 60. I turned to Mickey and he had a smile on his face that I haven’t seen since he had the winning ticket for the Belmont stakes in 1977. He and Cookie are so proud. 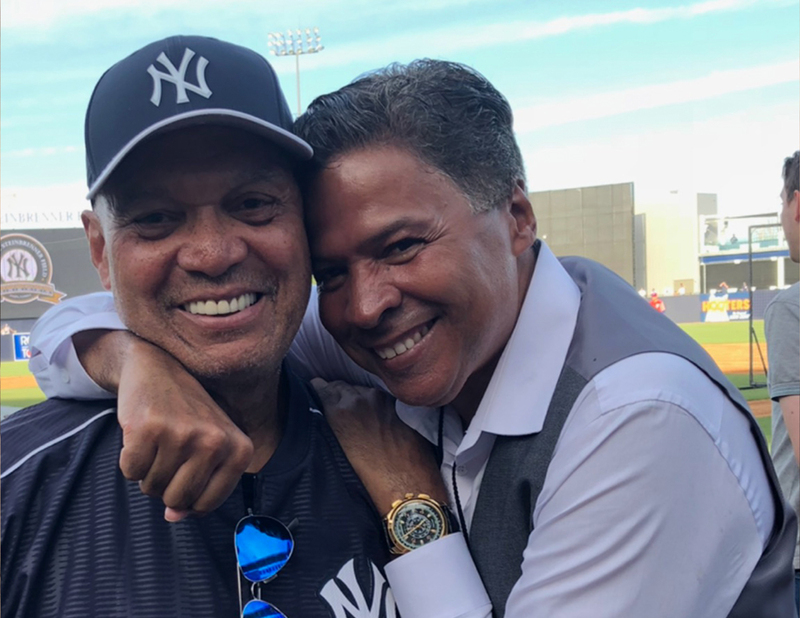 Someone in the suite asked, “What took the Yankees so long to do it?” Mickey’s response was, “The Yankees have always been there for me in more ways than you will ever understand.” At that point, Cookie grabbed his hand and gave Mick the Quick a very loving smile. Andrew Levy told me that Mickey takes it upon himself to act as a Yankees Ambassador and shakes as many hands as possible. Mickey probably takes more pictures than anybody in the Yankee organization. He tells wonderful loving stories about The Boss, Thurman, yes and even Reggie Jackson. This year marks the 40th anniversary of the 1978 World Champion Yankees. Mickey was such an important part of that team that he and Bucky Dent were honored at the Yankees Welcome Home Dinner this year and threw out the first pitch on opening day. Like all Yankee fans, I see Mickey as a happy go lucky personality that is quick to smile and is always willing to make fans feel great. As a close friend, I see Mickey as someone that has always been willing to give of himself in any way possible. When they say that a person is willing to give you the shirt right off his back, I immediately think of Mickey Rivers because I have literally seen him do it. I sadly say that he is truly one of the most generous people that I have ever known. I know for a fact that Mr. Steinbrenner loved Mickey as much as he loved any player because of how great he was for those Yankee teams of the 70s and because of Mickey’s gigantic heart. The greatest defensive center fielder that I have ever seen and a teammate of Mickey’s was the marvelous Paul Blair. He once said that Mickey’s fun loving ways in the clubhouse were as important as what he did on the field and that alone made Mickey an MVP in his eyes. I agree. I was recently sitting with Liberty DeVitto, one of the all-time great drummers in music. Liberty is best known for his work with Billy Joel. One of my favorite people in the music business happens to be the young drummer for the Frankie Valli band, Craig Pilo. Craig has always told me that his two favorite drummers are Ringo Starr and Liberty DeVitto. I mentioned this to Liberty and asked him if he would send Craig a video to say hello. While sending a nice greeting to Craig, Liberty said, “How could I not say hello to someone that works for the Man?” Referring to Frankie Valli. 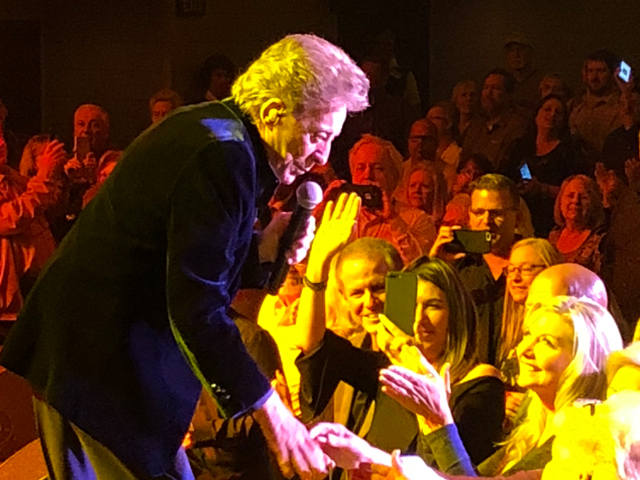 As cool as it was to have Craig receive a greeting from one of his hero’s, it was also nice to hear one of the all-time great musicians talk so glowingly about Frankie Valli. 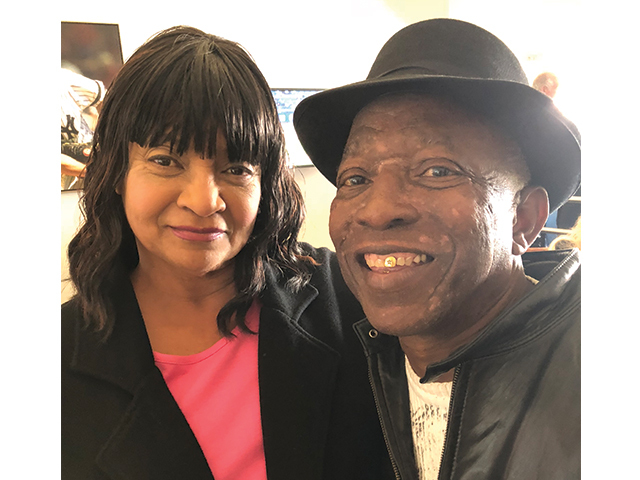 Liberty referred to Frankie as “one of the true all-time greats in the music business.” Earlier this week, Frankie was honored in Brooklyn for his lifetime achievements by some of the biggest stars in the world including Robert De Niro. A few of the greats born in New Jersey include Bruce Springsteen and of course maybe the biggest of them all, Frank Sinatra. However, when they talk about the “Jersey Boy” you know that they are referring to Mr. Frankie Valli. In 1976 Reggie Jackson played for the Baltimore Orioles. After that season he became a free agent. He also covered the World Series as a color commentator along with Keith Jackson and Howard Cosell. During one of the broadcasts, Howard Cosell asked Reggie what would happen if he signed with the Yankees. Reggie responded only the way Reggie could, he said they would name a candy bar after him. “The Reggie Bar.” During that off season I would officially go to work for Mr October as his “aide de camp” or right hand man. The biggest responsibility that I had that winter was to work hand in hand with the advertising agency, Grey Advertising. I had to make sure that they had anything and everything that would be needed to film all the commercials and all of the print adds. That included all the uniforms and baseball equipment that Reggie would use. Pete Sheehy, the great equipment manager for the Yankees, was so helpful because he had done the same for Babe Ruth, Joe DiMaggio, Lou Gehrig and Mickey Mantle. Pete gave me everything and more so that there would be no mess ups during the shoots. Pete really made me look good in Reggie’s eyes. I was always so grateful to Pete and he would always give me his famous wink of an eye. I am thankful to Reggie’s Marketing Agent, Matt Merolla, for always believing in me, and at 84 is still going strong. 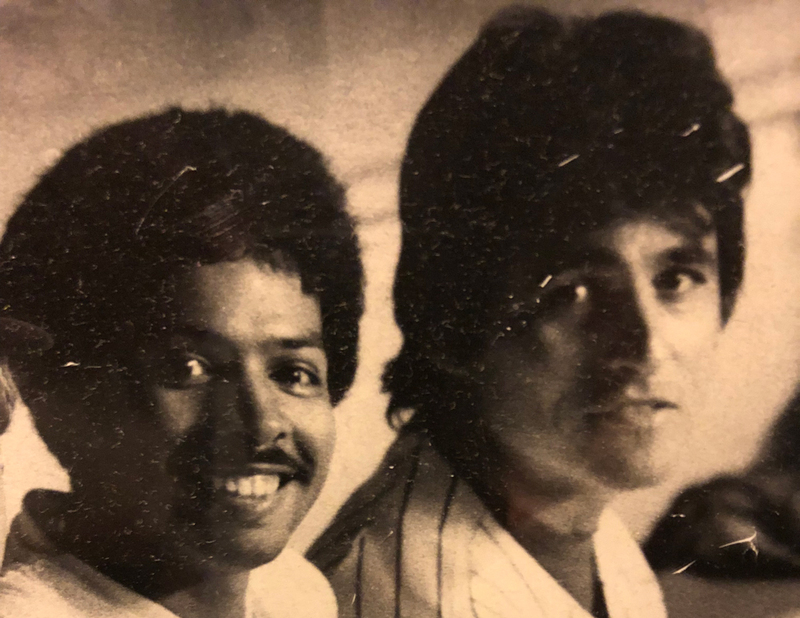 Throughout Reggie’s five years with the Yankees, there were quite a few commercials including Panasonic, Volkswagen and Getty Gas and I coordinated all of them. 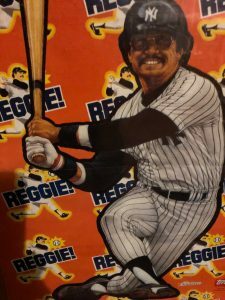 Thanks to Reggie I developed a pretty good reputation in the coordination of baseball themed commercials and movies. Before the 1978 season started, it was planned with the Yankees publicity and Marketing department that on opening day they would give “Reggie Bars” to every fan that walked into the Stadium. The electricity was really in the air. It really got exciting when Mickey Mantle and Roger Maris put up the World Championship flag. Now it was show time. During games I would sit directly behind home plate with portable video equipment filming what would be used to show the players their at bats after the game. I will never forget how nuts the fans got when Reggie came to bat his first time up. The pitcher for the White Sox was the knuckle ball pitcher, Wilbur Wood. If you are any kind of a baseball fan then you would know that the last pitcher that Reggie faced in the 1977 series was Charlie Hough, another knuckle baller. You know what Mr October did to him. With three balls and no strikes, Reggie hit Wilber Wood’s first pitch over the plate well over the center field fence. At that moment, the fans got delirious, they just went nuts and started to throw their Reggie Bars all over the field. It was literally raining Reggie bars! The fans were screaming, “Reggie, Reggie, Reggie” louder than during the World Series, if that’s even possible. I’m sorry that the fans didn’t get to taste the great tasting chocolate caramel flavored candy bar but at the same time the candy manufacturer could not have dreamed of such an incredible marketing scenario. Mission Impossible- Your Assignment is Mickey and Bucky! Every spring training, in the seventies, I wouldn’t report to camp until I would get a call from the traveling secretary, Bill Kane. Bill would tell me to pick up my airline ticket at LaGuardia airport and when I arrived in Fort Lauderdale I was to report to Mr Steinbrenner. When I did report to the Boss he would immediately give me my assignment. Usually it would be that his kids, Jennifer, Jessica and Hal, would be coming in on “so and so” dates and I was to pick them up at the airport (at that time of year Hank was away at school) Once they got settled in, I would have his youngest son, Hal, accompany me to the ball park. Back then it was known as Fort Lauderdale Stadium. Hal always enjoyed being with the players, shagging fly balls and just being in the clubhouse. In the spring of 1978, the Boss gave me my orders but there was an additional assignment. He told me that I was going to be rooming with Mickey Rivers, our great and beloved center fielder. Mickey could be, let me say a little flamboyant. To me he was just one wild and crazy guy. He was also very very funny. Mickey could have charged the players an entertainment fee for the best seats on the team bus. 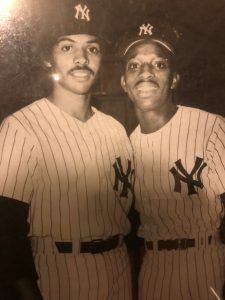 Like Oscar Gamble, Mickey knew how to put on a show and he was not afraid to “get on anybody.” Thurman Munson, Lou Piniella even Reggie was a target. If you were breathing you were fair game to Mickey. That spring, my orders were to stay with Mickey and make sure that he didn’t get into any trouble. The Boss even gave me extra meal money because he said that I would need it for when Mickey lost money at the horse track. Boy was he ever right. One night, I had to get money from Thurman, who happened to be at the track with Piniella, just so we could get back to the hotel. However, other than little things like that we had a very uneventful spring. I think Mickey was better at looking out for me than I was for him- he always had MY best interest at heart. To this day, we still look out for each other. The following spring, once again, I would meet with the boss and this time he wanted me to room with Bucky Dent. That past October, Bucky had hit maybe the most famous home run in Yankee history and went on to become the most valuable player in the 1978 World Series. That past winter he did a lot of commercials and was in a movie called “Dallas Cowboys Cheerleaders.” I rehearsed lines with Bucky and he was actually a pretty good actor. I teased him that whole next season about his big line in the film “But baby you know that I love you.” I would stand up in the back of the team bus and in front of everybody I would yell out that line and everyone would scream with laughter. On my first day at camp I walked into his hotel room and Bucky said, “What the hec are you doing here?” I told him that I was his roomie and he said, “Did Steinbrenner send you here?” I didn’t say anything. He stared at me and I just stared back at him and then we started to laugh. He said, “What does he expect you to find?” I told Bucky that I hope that what the Boss expects to happen actually does happen and I just won’t say anything. We laughed like crazy because Bucky knew that I would never betray a player and I think the Boss knew that too. The Boss never really asked me about what we did. One time Mr. Steinbrenner ran into Bucky and I at a fancy restaurant with some of Bucky’s friends. The next day the Boss said that I looked like I was having too much fun. The Boss didn’t realize that one of the people with us was Bucky’s priest, Father Joe. Even though he had become such a big star, Bucky was a wonderful roommate- even to the so called Batboy, me! Bucky used to keep his money in an attaché case under the bed. Before we went out he would pull out the money that he needed and he would always ask me. “Do you need any money?” I always said, “No.” But I loved the fact that he asked me. Mickey and Bucky were great roomies in an era when every team had assigned roommates. This doesn’t happen any more because the salaries are too big and most players get their own apartments in the spring. I think this is a big reason why the teams were much “closer” back then than they are now. 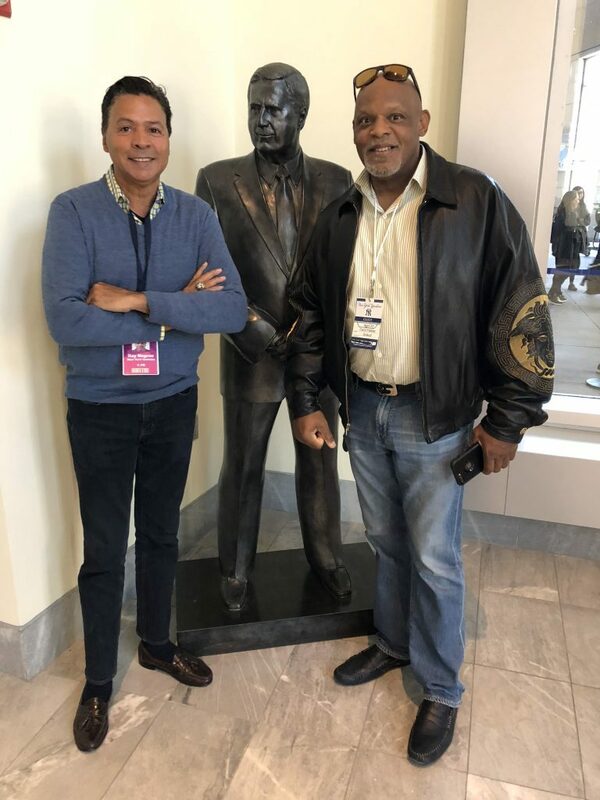 I find it ironic that on opening day today, at Yankee Stadium, my roommates, Bucky Dent and Mickey Rivers, are throwing out the first pitch and being honored at the Welcome Home Dinner. It is a wonderful and well deserved honor for both of these two great individuals. I have been so blessed to be associated with people like these men from the 77 & 78 World Champions. It’s wonderful that the Yankee Organization does not forget the great men that won those championships for New York. To this day, Bucky, Mickey and I still refer to each other as “roomie” and I am proud of that. …..This tape will self destruct in 5 seconds…..